On this day in 1895, the world’s first commercial movie screening takes place at the Grand Cafe in Paris. The film was made by Louis and Auguste Lumiere, two French brothers who developed a camera-projector called the Cinematographe. The Lumiere brothers unveiled their invention to the public in March 1895 with a brief film showing workers leaving the Lumiere factory. On December 28, the entrepreneurial siblings screened a series of short scenes from everyday French life and charged admission for the first time. Movie technology has its roots in the early 1830s, when Joseph Plateau of Belgium and Simon Stampfer of Austria simultaneously developed a device called the phenakistoscope, which incorporated a spinning disc with slots through which a series of drawings could be viewed, creating the effect of a single moving image. The phenakistoscope, considered the precursor of modern motion pictures, was followed by decades of advances and in 1890, Thomas Edison and his assistant William Dickson developed the first motion-picture camera, called the Kinetograph. The next year, 1891, Edison invented the Kinetoscope, a machine with a peephole viewer that allowed one person to watch a strip of film as it moved past a light. In 1894, Antoine Lumiere, the father of Auguste (1862-1954) and Louis (1864-1948), saw a demonstration of Edison’s Kinetoscope. The elder Lumiere was impressed, but reportedly told his sons, who ran a successful photographic plate factory in Lyon, France, that they could come up with something better. Louis Lumiere’s Cinematographe, which was patented in 1895, was a combination movie camera and projector that could display moving images on a screen for an audience. 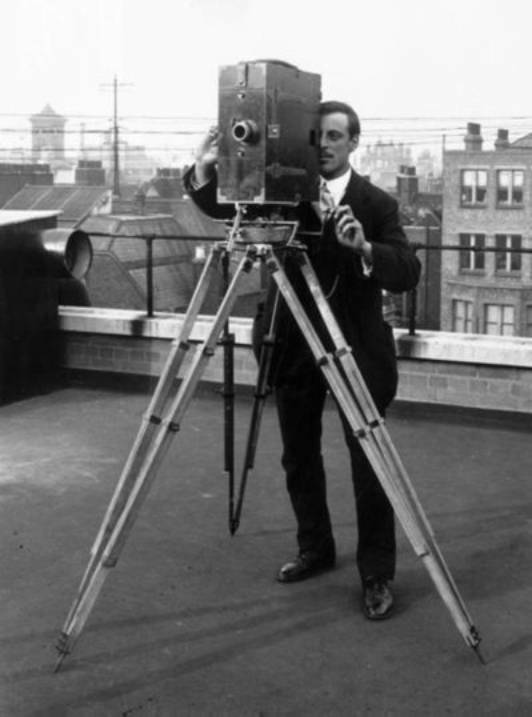 The Cinematographe was also smaller, lighter and used less film than Edison’s technology. The Lumieres opened theaters (known as cinemas) in 1896 to show their work and sent crews of cameramen around the world to screen films and shoot new material. In America, the film industry quickly took off. In 1896, Vitascope Hall, believed to be the first theater in the U.S. devoted to showing movies, opened in New Orleans. In 1909, The New York Times published its first film review (of D.W. Griffith’s “Pippa Passes”), in 1911 the first Hollywood film studio opened and in 1914, Charlie Chaplin made his big-screen debut. In addition to the Cinematographe, the Lumieres also developed the first practical color photography process, the Autochrome plate, which debuted in 1907.